The current election has raised many questions regarding the proper route to take in terms of policy surrounding immigration. With one candidate promising deportation and a wall, and another candidate promising a path to citizenship, our country has never been so divided on the issue of immigration. This year, the Poucher Lecture will occur only ten days after the Presidential Election. Our distinguished immigration experts will discuss the realities of immigration policy reform and what reform may look like under the newly elected President. 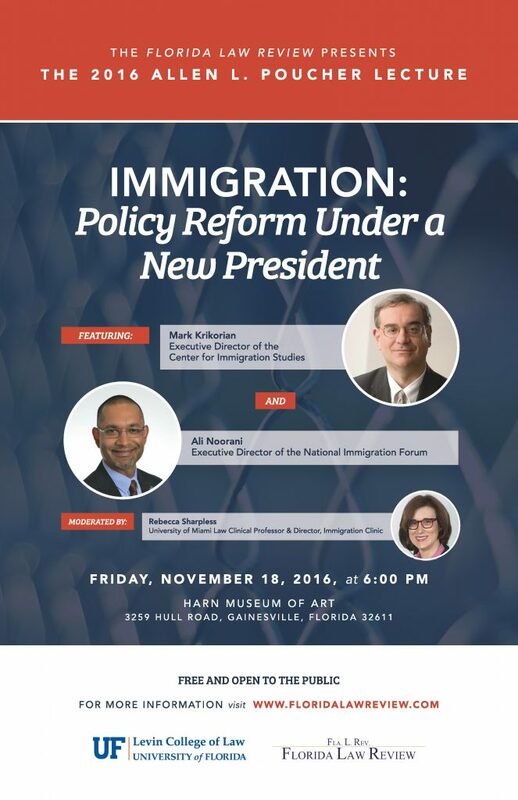 “Immigration: Policy Reform Under a New President” will be held Friday, November 18, at 6:00 P.M. at the Harn Museum of Art, located at 3259 Hull Road, Gainesville, Florida 32611. The lecture is sponsored by the Allen L. Poucher Legal Education Series and is presented by the Florida Law Review. The lecture is free and open to the public. Free parking will be available at the Phillips Center parking garage as well as in the parking lot in front of the Harn Museum. The Allen L. Poucher Legal Education Series was endowed by Betty K. Poucher, Elizabeth Poucher Reynolds, and Allen L. Poucher, Jr. in honor of Allen L. Poucher Senior. A humanitarian who lived a life dedicated to service, Allen L. Poucher Sr. graduated from UF Law in 1942 and practiced law for more than 60 years. The Poucher Legal Education Series seeks to provide a venue for prominent legal, political, and business leaders to discuss important issues facing our nation and world today. It has featured distinguished panelists such as former U.S. Supreme Court Justice Sandra Day O’Connor, five former Florida governors, a former CIA spy, a four-star general, and numerous legal scholars. Media inquiries can be directed to Florida Law Review Executive Symposium Editors Cayman Weimer and Ashlyn Robinson at press@floridalawreview.com or at 352-273-0670. For more details or to submit a question to the panelists, please visit the Florida Law Review’s website at www.floridalawreview.org or contact the office at 352-273-0670. Can’t join us live? Watch online here. Mr. Krikorian’s knowledge and expertise in the immigration field are sought by Congress, as well as the mainstream and new media. He frequently testifies before Congress and has published articles in numerous outlets including The Washington Post, The New York Times, Los Angeles Times, and Commentary. He is a contributor at National Review Online, and has appeared on 60 Minutes, Nightline, NewsHour with Jim Lehrer, CNN, and NPR, among other television and radio programs. In 2015, Ali was named a lifetime member of the Council on Foreign Relations. He holds a Master’s in Public Health from Boston University and is a graduate of the University of California, Berkeley. Ali lives in Washington, D.C. Professor Sharpless joined the University of Miami School of Law faculty in the fall of 2009 and directs the Immigration Clinic and teaches immigration law. She researches and writes in the areas of progressive lawyering, feminist theory, and the intersection of immigration and criminal law.